A Massage at 36,000 Feet! We landed in London late in the evening. Heathrow airport was crowded and the arrivals lounge area was a nightmare for the claustrophobic. In other words, we felt we hadn’t left home at all! But things began looking up the moment we left the airport. There was a car waiting for us and the driver helpfully pointed out the many sights on the way to our hotel. The Victorian buildings, the roads themselves, and the many monuments are a constant reminder of the city’s medieval past and its rich heritage. London is a very beautiful city and very distinct from any other city I have seen so far. We were staying at the Thistle Victoria, a grand old hotel which was clearly built in a different era. The grand staircase, the large portraits on the wall, the polished chandeliers, heavily curtained corridors, and the gas-fired heating system all added to its old-world charm. The hotel’s location is excellent. Right over the busy Victoria station (you can directly get into the hotel from the tube-station) the hotel is about 5 minutes walk from Buckingham Palace, and about 10 minutes from Hyde Park corner. Most popular shopping and entertainment destinations (such as Knightsbridge and Oxford Street) are only a couple of tube stations away. One of the most popular tourist attractions (and also the most over-rated) in London is the changing of guards at Buckingham Palace. However, we were able to do something more special. Buckingham Palace is open to the public during the months of August and September when the Queen and her family vacation outside of London. 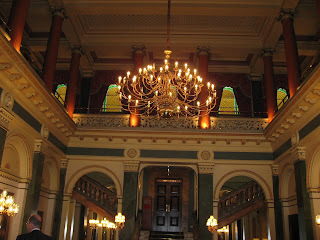 So the next day, on a bight but chilly London morning, we stepped into the glittering staterooms of Buckingham Palace. This being the 60th marriage anniversary of the Queen, there was a special exhibition that included the Queen’s wedding dress, her diamond tiara, and many wedding gifts, portraits and exhibits that are usually out-of-bounds to visitors. My wife and four year old daughter went ooh and aah over the pearl-studded wedding dress and diamond tiara, while I admired the elaborate dinnerware and furniture on display; they were part of the 25000 wedding gifts the royal couple received. Since the wedding happened just after WW2 ended, some gifts were more functional like a sewing machine! 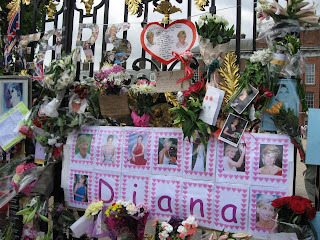 The other important event that coincided with our visit to London was Princess Diana’s 10th death anniversary. We went down to Kensington Palace and joined her many admirers who left flowers, photos and messages on the gates of the palace where she had spent happier times before her death. I was particularly excited as I drove down the many familiar streets. Streets which I knew from movies and books since childhood. Seeing pubs and restaurants frequented by Charles Dickens and Oscar Wilde that were still up and running. There is a place where Ho Chi Minh is supposed to have once worked as a cook! There are still signs of London's two most horrific events: the Great Fire of 1666 that burnt down 8o percent of the city and the Blitz of World War II. Trafalgar Square with Nelson’s statue was particularly interesting. One of England's biggest heroes, he joined the Royal Navy when he was 12; among his other victories, if he hadn’t defeated Napoleon’s navy in the Suez most unexpectedly, Tipu Sultan may have been alive much longer and the French may have even ended up ruling India during the 19th century. Trafalgar Square is named after the battle of Trafalgar where Nelson won his final battle, but at the cost of his life. His statue is made from molten cannon balls from the ships he commandeered at that battle. I spent a lot of time on the bridges of London: I drove over them, cruised under them, and photographed them from air as I went up on the London Eye. But most of all, I loved the buildings that lined every road. Every one seems to have a story to tell and gives London its character. Certainly, a very different sight from the glass and steel structures you see in the US and in most of urban India. We spent only two days in London and couldn't get time to indulge in gourmet dining or local specialities. But if you are planning a trip to London, you should treat yourself to a hallowed English tradition: high tea. 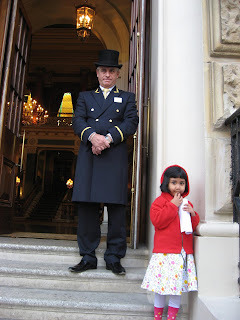 If you can't get a reservation at the Ritz, try Harrods instead. High tea will usually include scones with clotted cream and preserves and a large slices of dessert along with your Earl Grey. 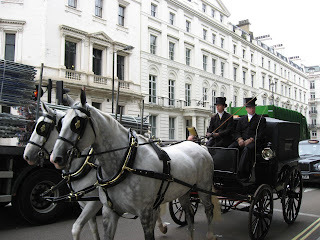 Also, if you want to travel London's historical spots quickly, the hop-on, hop-off tour buses are the best option. There are two options: The Original Tour and the Big Bus Company. I think the former is the best deal; they have been in business the longest, have over 100 buses, and cover more areas. Additionally, they have a free two-way river cruise built into their base ticket. Use the tube only if you are travelling alone, are not claustrophobic, and can manage to get in and out in spite of the rush-hour hordes. What an amazing trip - I am so jealous! And, it sounds like a fascinating time to be there, with the 60th wedding anniversary (25,000 gifts? Did she even use any, if they are all just on display?) and the 10th anniversary of Diana's death. Thanks for all of the great pics and detail! Looks like you had a great time there... Is that guard actually smiling in that picture?? @foodette: Ha ha, I guess they would have used some. @sig: We didn't have the time to eat at any place that would require reservations. Did hear about Veeraswamy, the very first Indian food restaurant in England. Hi Traveler; thanks for your visit and nice comments on my new blog. Thanks also for your add at BlogCatalog! You really have a great blog too and how nice to travel with you all around the world. 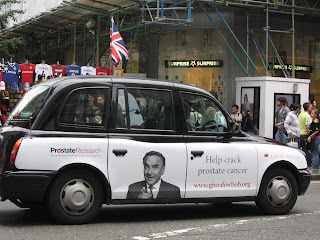 I've been to London a lot of time - seeing it through your eye was great - thanks for sharing! 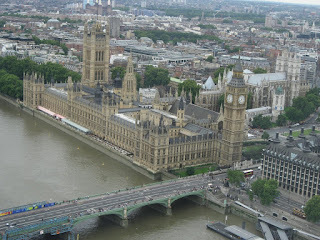 I really want to go to London. Great site. I'm also afflicted by the the travel bug, so I'll be adding your site to my links. @rennyba: Thanks for adding me to your links. @sunchaser: Welcome to my blog and thank you very much.